1. Authenticity before marketing. Have personality. Build community. Those nonprofits who are most successful at utilizing social networking Web sites like Twitter, Facebook, and MySpace know from trial, error, and experience that a “marketing and development approach” on social networking sites does not work. Simply put, it comes across as lame. Traditional marketing and development content is perfectly fine for your Web site and e-mail newsletters, but Web 2.0 is much more about having personality, inspiring conversation, and building online community. Nowhere is this more true than on Twitter. Relax, experiment, let go a bit… find your voice. Be authentic. 2. Be nice. Be thankful. Reply and Retweet! Twitter functions much like Karma. The nicer you are to people in the Twitterverse, they nicer they are to you in return. The more you ReTweet (RT) others, the more they will RT your Tweets in return. And whether it’s Twitter, MySpace, Facebook or YouTube, if someone does something nice for you in the public commons of Web 2.0, it is always a good practice to send them a message of “Thanks… much appreciated!”. Kindness and appreciation will make you stand out from the others and makes an excellent impression. 3. Follow everyone who follows you. This is a hard one for a lot of nonprofits. They want to keep their “Home” view clutter free and controlled and only follow a select few. Honestly, they only want to follow those whose Tweets that they are really interested in reading. But I say this often… “This time it is not about you, it is about them.” Web 1.0 communications is all about us and our messaging i.e, your Web site and e-mail newsletter. Web 2.0 is all about your supporters and their messaging. It’s better to create a personal Twitter profile in order to only follow those select few you are interested in reading, but if you are going out on Twitter behind your organization’s logo a.k.a. avatar, it is a mistake to not follow all your followers in return. Why? Twitter is about conversation. You can’t have a conversation on Twitter if you are not following your followers. It is a one-sided relationship. They can’t message you on Twitter if you are not following them. It’s a snub. Let’s face it… people on Twitter want to be followed. That’s what the site is about! How can you build community on Twitter if you won’t even participate with your followers? Have a look around Twitter… you will see the most successful, ReTweeted nonprofits follow everyone who follows them. 4. Use “Favorites” to organize the chaos and feature your most important Tweets! So, if you are going to follow everyone who follows your organization (which is hopefully thousands of people) then “favorite” Tweets by those who you are most interested in reading and favorite your most important Tweets. The favorites option on Twitter is a simple, excellent tool to help you organize the chaos. 5. Don’t tweet about your coffee (unless it is fair trade), the weather, or how tired you are. Provide value to your followers, not chit-chat! It’s one thing to chit-chat about the weather, your headache, or how you need coffee to wake up in the morning on your personal profile on Twitter, but it’s quite another if you are active on the Twitterverse via your organizational profile. The messages you send reflect upon your organization. Example of what not to Tweet: “Such-and-such Nonprofit got stuck in traffic this morning. Ugh! I need coffee and a vacation… and I think I am getting a headache!” No one likes a whiner and this just makes it sound like Such-and-Such Nonprofit is not a fun place to work. People follow you because they want good content from your organization on subjects relevant to your mission. Make sure your Tweets provide value and are Re-Tweetable. 6. Don’t only Tweet your own content. Twitter is a news source. Participate in news. 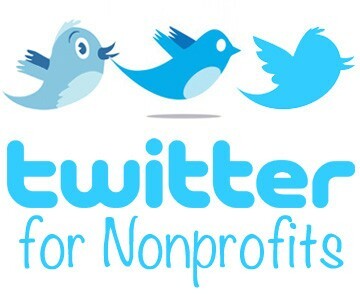 Tweet articles or blog posts by your favorite newspapers, bloggers, or other nonprofits (yes… other nonprofits! Find allies, build relationships). If it is a good read or a good resource, it reflects well upon your organization that you Tweeted it. There is also a good chance you might get ReTweeted if the article is deemed timely and worthy by the Twitterverse. 7. Send messages, but not via auto-responders. There are tools out there that will automatically message your new followers. Don’t use them. It’s Spam. It’s not authentic. It’s not human. It’s lazy marketing. I think this cartoon sums up auto-responders perfectly. 8. Don’t worry about those that “unfollow” you. It’s easy to feel slighted when someone stops following you. What did I say? Did I do something wrong? Let it go. Who knows why they followed you in the first place. Give it no more than 3 seconds thought and then move on. 9. Limit your Tweets to 5 per day, and no more than 6! I have been polling on Twitter and the Twitterverse has revealed that less is more when it comes to Tweeting. See poll results. 10. Twitter is what you make of it. You get out of Twitter what you put into it. This is the same of all Web 2.0 social networking sites. Twitter is a fun, valuable tool that can drive significant traffic to your Web site (start watching your Web site referral logs!) and help build and strengthen your brand in the online world of Web 2.0, but just like Facebook and MySpace, Twitter requires time and energy to produce results. You get out of it what you put into it. If you do one Tweet a week, you will get the results of one Tweet. But if you Tweet 4 times daily Monday through Friday… you will get the results of 20 Tweets weekly. Again, it’s about community building around your mission and programs. Just having profile on Twitter (or MySpace, or Facebook) does not magically produce any results. You have to work these profiles. Find the person on your staff who loves Web 2.0 and enjoys working the sites and/or find a marketing/pr intern from your local university that needs to do a senior project! If they are getting college credit, then you know they have to stay around for at least a semester.